Only 5 In Stock Order Today! 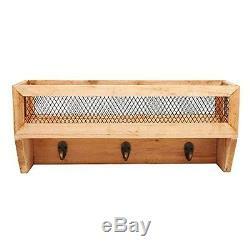 Give your home or garden the perfect touch of rustic charm with this lovely storage rack. Made of wood with a charming, rustic finish, this wall rack features a top shelf that allows you store and display your favorite knickknacks and keepsakes while keeping them safe from falls, thanks to the railing made of wood and metal wire mesh. Below the shelf, 3 sturdy metal hooks provide you with the perfect place to hang keys, leashes, gardening tools, and other small items to keep them safely stored and easy to find. When you're ready to fill your home or garden with rustic charm, simply mount this rack on any wall using appropriate installation hardware (not included), and you'll have the perfect combination of style and storage for any space. Wall-mounted rack with a rustic-style wood finish. 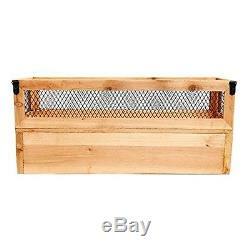 Top basket features a wood and metal wire mesh border to help keep your belongings securely stored. 3 sturdy metal hooks help hang and organize keys, leashes, garden tools, and other small items. Easy to install on any wall using appropriate mounting hardware (not included). 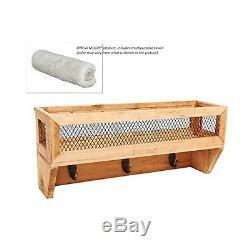 Product includes multipurpose cleaning towel. Approximate Dimensions (in inches) : 16.5 W X 4.75 D X 7 H. We thank you in advance and appreciate your business!! Please check out my other items. Thank you and have a great day! Thank You For Your Business! The item "Wall Mounted Storage Wire Mesh Basket Rack Coat Hooks Key Mail Letter Organizer" is in sale since Wednesday, November 16, 2016. 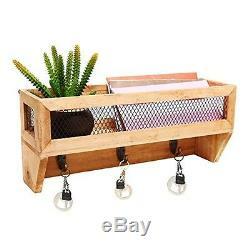 This item is in the category "Home & Garden\Home Décor\Key & Letter Holders". The seller is "rrs_25" and is located in Spring Valley, California. This item can be shipped to United States, United Kingdom, Denmark, Romania, Slovakia, Bulgaria, Czech republic, Finland, Hungary, Latvia, Lithuania, Malta, Estonia, Australia, Greece, Portugal, Cyprus, Slovenia, Japan, China, Sweden, South Korea, Indonesia, South africa, Thailand, Belgium, France, Hong Kong, Ireland, Netherlands, Poland, Spain, Italy, Germany, Austria, Israel, Mexico, New Zealand, Singapore, Switzerland, Norway, Saudi arabia, Ukraine, United arab emirates, Qatar, Kuwait, Bahrain, Croatia, Malaysia, Brazil, Colombia, Panama, Jamaica, Barbados, Bangladesh, Bermuda, Brunei darussalam, Bolivia, Ecuador, Egypt, French guiana, Guernsey, Gibraltar, Guadeloupe, Iceland, Jersey, Jordan, Cambodia, Cayman islands, Liechtenstein, Sri lanka, Luxembourg, Monaco, Macao, Martinique, Maldives, Nicaragua, Oman, Peru, Pakistan, Paraguay, Reunion.